This new Pokey Pin product designed by Mrs. Miner 's Monkey Business piggybacks nicely with the original Pokey Pin Fine Motor Alphabet Centers To Go (Set 1). This set is designed with the differentiating teacher in mind. 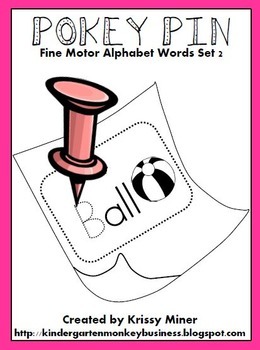 Having this set allows a teacher to have students doing the same center, but the student who already knows their ABCs, can work on a word that goes with each letter. For example, instead of pinning Aa and a picture of an apple, the higher level student would be pinning the word apple as well as the picture. This is a very simple, yet effective center to set up and once children are introduced to it, it quickly becomes a classroom favorite. All you do is staple the half sheets (provided in this kit) to a colored piece of paper. The children use push pins/tacks to poke holes along the lines on a soft surface. Children are working their hand muscles for this and typically find this activity very enjoyable and calming. They view the end results as magical, especially when hung on a window. Bring fine motor back to your classroom and feel great about it because the children are also working on needed literacy skills. Students love this activity and it buys the teacher quiet time to assess or pull small groups!